The US President gave a one-sided account of the costs and benefits to the country's economy from immigration. 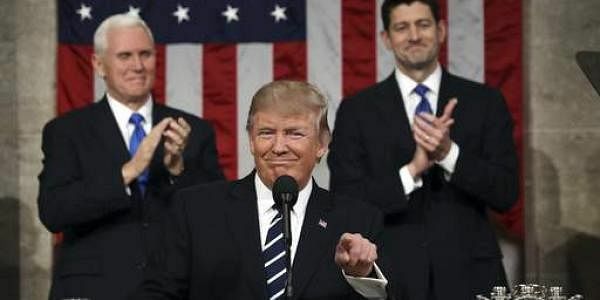 WASHINGTON: President Donald Trump boasted Tuesday night about corporate job expansion and military cost-savings that actually took root under his predecessor and gave a one-sided account of the costs and benefits to the economy from immigration — ignoring the upside. The report found that while first-generation immigrants are more expensive to governments than their native-born counterparts, primarily at the state and local level, immigrants' children "are among the strongest economic and fiscal contributors in the population." This second generation contributed more in taxes on a per capita basis, for example, than did non-immigrants in the period studied, 1994-2013. TRUMP: "Since my election, Ford, Fiat-Chrysler, General Motors, Sprint, Softbank, Lockheed, Intel, Walmart and many others have announced that they will invest billions of dollars in the United States and will create tens of thousands of new American jobs." THE FACTS: It's unlikely Trump is the sole or even primary reason for the expected hiring he cites. Many of the announcements reflect corporate decisions that predate his election. In the case of Intel, construction of the Chandler, Arizona, factory referred to by Trump actually began during Barack Obama's presidency. The project was delayed by insufficient demand for Intel's high-powered computer chips, but the company now expects to finish the factory within four years because it anticipates business growth. More important, even as some companies create jobs, others are laying off workers. The best measure of whether more jobs are actually being created is the monthly employment report issued by the Labor Department, which nets out those gains and losses. The department will issue its report for February, the first full month of Trump's term, on March 10. TRUMP: His budget plan will offer "one of the largest increases in national defense spending in American history." TRUMP: "According to data provided by the Department of Justice, the vast majority of individuals convicted for terrorism-related offenses since 9/11 came here from outside of our country. We have seen the attacks at home — from Boston to San Bernardino to the Pentagon and yes, even the World Trade Center." THE FACTS: It's unclear what Justice Department data he's citing, but the most recent government information that has come out doesn't back up his claim. Just over half the people Trump talks about were actually born in the United States, according to Homeland Security Department research revealed last week. That report said of 82 people the government determined were inspired by a foreign terrorist group to attempt or carry out an attack in the U.S., just over half were native-born citizens. Even the attacks Trump singled out weren't entirely the work of foreigners. Syed Rizwan Farook, who along with his Pakistani wife killed 14 people in the deadly 2015 attack in San Bernardino, California, was born in Chicago. It's true that in the immediate aftermath of Sept. 11, the FBI's primary concern was with terrorists from overseas feared to be plotting attacks in the United States. But that's no longer the case.